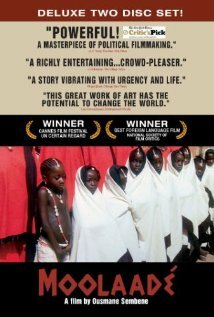 Set in a village in Burkina Faso, this is the day when six 4-9-year-old girls are to be 'cut' (the act of female genital mutilation) Two of the girls have drowned themselves in the well to escape the operation. The four other girls seek "magical protection" (moolaadé) by a woman (Colle) who seven years before refused to have her daughter circumcised. Moolaadé is indicated by a coloured rope. But no one would dare step over and fetch the children. Moolaadé can only be revoked by Colle herself. Her husband's relatives persuade him to whip her in public into revoking. Opposite groups of women shout to her to revoke or to be steadfast, but no woman interferes. When Colle is at the wedge of fainting, the merchant takes action and stops the maltreatment. Therefore he is hunted out of the village and, when out of sight, murdered.